Every Step, Every Mile Together! 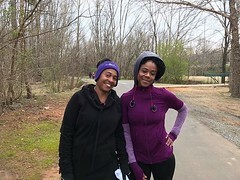 I thought about it more than twice, before I decided to go to the greenway… but I said, “Well, if I don’t like it, I just will not go back, but… I LOVED it. I was very welcomed by all the ladies and I felt the good energy and encouragement, I mean I could really feel the love. The other detail that took me greatly by surprise was the circle of prayer; it was so powerful and I truly felt His presence. Since then, I have never stopped running. On my journey, I have met wonderful women that touched my life in one way or another. I have learned that it is not only about running; it’s also and most importantly about being able to build personal confidence, believing in yourself and believing that you can accomplish anything you set your mind to with effort and dedication. 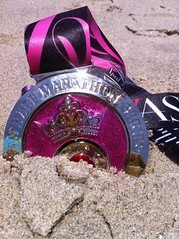 In May, I completed the first of eight official races, and in June, my dream became true. I was able to complete my first triathlon. I have no words to describe the feeling of crossing the finish line. It was very exciting. 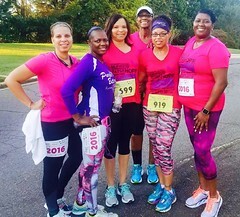 I not only accomplished something very important, but at the finish line, I saw the faces of the woman that have supported me all the way and have helped me to get there….the Purple Butterflies. 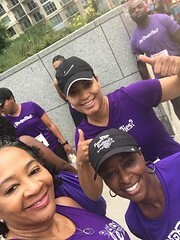 I will continue running because I am a runner, because I feel peace while I am running, because I believe in myself, and because I love the sisterhood I feel with the PURPLE BUTTERFLIES. This entry was posted in A Butterfly Story, About PBRC. Bookmark the permalink.